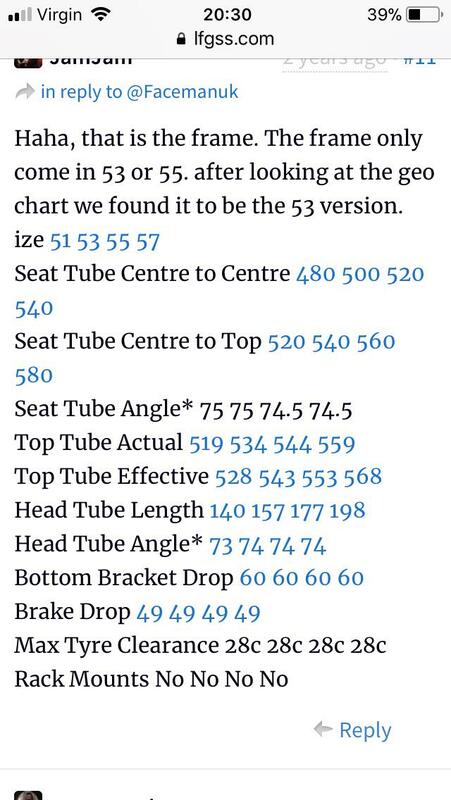 Those measurements definitely make mine a 53. This is on here somewhere; fortunately I screenshotted it once. He collected the wheels and pedals last week, rest still there. I’ve been trying to persuade my brother to get this...but he’s being stubborn. Someone buy it before I do with money I don’t have. You should buy it. I had a look at it earlier when picking up the cranks and it's really really nice. Any more detail on this? I just bought it! Those cranks are rubbish, I'll give you £10 for them and not a penny more. Thanks for saving my wallet!